DG Energy strives for 100% satisfaction with our oil & gas industry clients. That’s why we have established, documented, implemented, and maintained an industry-specific quality management system for all oil & gas products and services. We measure the effectiveness and improve upon our quality management system in accordance with the requirements of API Q1 and ISO 9000 / 9001. 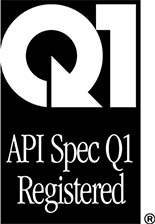 DG Energy is registered through the American Petroleum Institute (API) with an active API Q1 certificate, an ISO 9001:2008 certificate, and an API 16A license. Our oil & gas division provides multiple product and service solutions for upstream, midstream, and downstream applications. We provide an array of products and services for refineries, commercial power plants and other industrial markets. Our mobile dielectric testing labs service all of North America.